This was an excellent, riveting, read. Catherine was a fascinating woman who came to Russia from Prussia when she was fourteen to marry the ridiculously perverse future King Peter with whom she had a loveless, miserable, and sexless marriage. She nonetheless triumphed. A disciple and friend of Voltaire, Diderot, and the ideas of the Enlightenment, she was a true intellectual and intense life long reader, who spoke, read, and wrote Russian fluently. In fact she was fluent in four or five languages and was obviously an intellectually gifted individual. She ruled Russia for 44 years, during which time she fought and won several wars. She supervised the building of many architecually significant palaces and museums. She was a patron of the arts and collector of a world class collection of art. 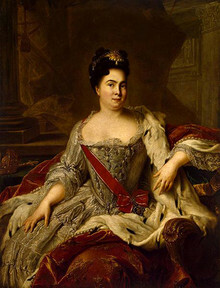 She spent several years researching and writing the “Nakaz,” which was a modernization of Russian law based on the ideas of the Enlightenment in which she attempted to codify an enlightened government’s obligation to it’s people and the people’s obligation to society based on a set of just and fair laws. In the Nakaz she sought to eliminate all torture and capital punishment. She tried and failed to set up a system which would result in the freeing of serfs. She was writing about the dignity and rights of man, before these ideas were championed across the pond, in America by people like Thomas Jefferson. She urged the humane and fair treatment of serfs and the elimination of corporal punishment. Her Nakaz was said by some historians, to be one of the most remarkable written codifications of law written by a sitting monarch. She also had insatiable sexual appetites and had a long string of lovers, many quite younger than her, well into her later sixties, really up until her death. She was like a female Henry VIII, plucking up handsome young courtiers well into her dotage. Monogamy didn’t seem to hold much appeal for her. This of course makes for very interesting reading! Like all of Massie’s books, this book will thoroughly educate you about this period of Russian history and thoroughly interest you in the process. She had to live with Queen Elizabeth, her mother in law…. She didn’t just survive (which was a daily challenge), but became Catherine the Great. Amazing!!! I am going to St Petersburg this year fall to see The Hermitage and her Winter Palace. Completely amazing woman! Such an amazing monarch…well apart from her ‘harem’ habits, but otherwise an admirable queen.